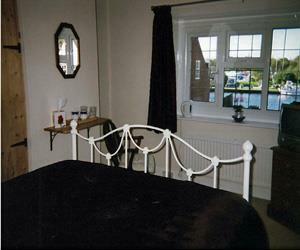 The Moorhen01692 631444work Guest AccommodationOur B & B accommodation is situated in the picturesque Broadlands village of Horning, right in the heart of the Broads. We are set in the centre of the village next to all the shops, three restaurants and two pubs. Two of our bedrooms overlook the river, one double & one twin/family room. Two are ground floor, one double and one twin/family room in a peaceful garden setting. The garden rooms also have a lockable interconnecting door that may be more suitable for families with older children or adults that may need support. All our rooms are fully en-suite. Come and use us as a base for water-born activities such as day-boats, canoeing or the Mississippi paddle steamer. Possibly a day out on the train from our local station to Sheringham and then the steam train to Holt. Walking, cycle hire and a fabulous day out at the adventure park Bewilderwood. Our B & B accommodation is situated in the picturesque Broadlands village of Horning, right in the heart of the Broads. We are set in the centre of the village next to all the shops, three restaurants and two pubs. Make this a green holiday. We will meet you from the train and help you create a car free holiday. We are an equal opportunities establishment, all are welcome. The Moorhen is an ideal starting point for the B&B Canoe Trail on the River Bure and Ant. An exciting innovation in 2008 that produced relaxed bespoke holidays down the river with your luggage moved ahead for you as you paddle downstream. Cycle storage available. Children welcome from any age. From the Norwich ring road take the North East direction A1151 through Sprowston on to Wroxham/Hoveton. At the twin mini roundabout right A1062 to Potter Heigham. At Horning turn right into the village we are on the left next to the delicatessen. We always suggest our ground floor rooms have assisted disability access.